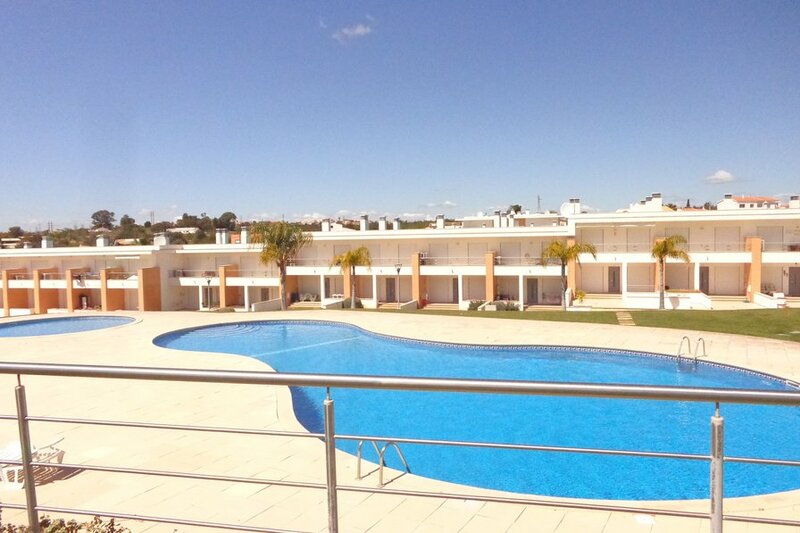 Villa with 2 bedrooms for 6 people, air conditioning, communal pool, large garden, located in Albufeira, Branqueira just 2 km from the beach away. This nicely decorated 97m2 large terraced house, which has 3 detached sides, is located in a very nice and large, condominium with over 5000 m² of lawned area, large communal pool and one children's pool. Branqueira, a village between Olhos de Água and Albufeira, where many orange orchards of the Algarve are located and where the corresponding floral scent is always present. Distance to the city center is only 5km and to Olhos de Água, a well-known fishing village, is only 3km. 2 bedrooms of which one is furnished with two single beds and the other with a double bed. Living - dining room, furnished with a sofa bed for 2 people. Fully equipped kitchen with dishwasher, washing machine, refrigerator, stove, oven, coffee maker, toaster, kettle, blender and microwave. Covered terrace with garden table and chairs.